With Valentine’s Day around the corner, love may be in the air, but so is some major stress. What should you get for your significant other? This search might be so unnerving because it requires finding a delicate balance. Being overbearing to your sweetheart could come across as scary instead of sweet, but you’ve still got to make the day better than any other Thursday. Well, here at Spoon, we believe that while finding a perfect gift may be nearly impossible, you can’t go wrong with dessert. What better way to win over your Valentine than with the classic combination of salty and sweet, and in truffle form, no less? The key to your special someone’s heart might not be gold but instead might be made out of peanut butter, pretzels and chocolate. But you don’t need a Valentine as an excuse to make these morsels. Gather your friends and split the recipe up into separate tasks. You, of course, should volunteer to be the final taste tester. Because this day is all about making sacrifices for love, right? 1. Using an electric mixer, combine peanut butter and butter until creamy and smooth. 2. Gradually incorporate powdered sugar until combined. 3. Mix in crushed pretzels until the mixture has a dough-like consistency. 4. Take a heaping teaspoon of dough and shape it into a ball, then place it on a baking sheet. Repeat for all of the dough. Tip: chill the dough for 10 minutes just to make it easier to roll into balls. 5. Refrigerate the balls on the baking pan for at least 30 minutes. This will make them easier to dip into chocolate. 6. As the balls are cooling, melt chocolate chips in a microwave for about 1 minute and 30 seconds or until smooth. Be sure to stir the chocolate chips halfway through and watch them carefully the entire time. Chocolate can burn easily in the microwave. 7. 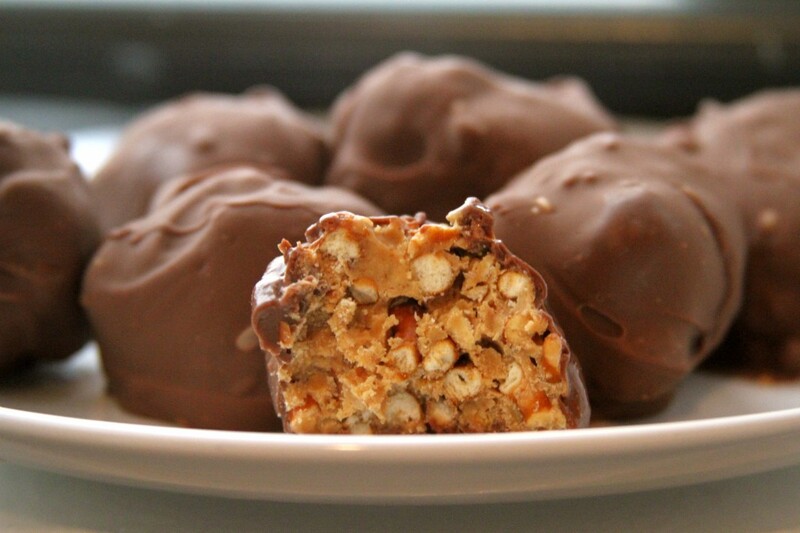 Use a spoon to dip the balls into the melted chocolate, rolling around to coat it entirely. Place the coated balls back on the baking sheet. 8. Freeze or refrigerate truffles until chocolate has hardened, at least 30 minutes. Serve right away or store in the fridge.